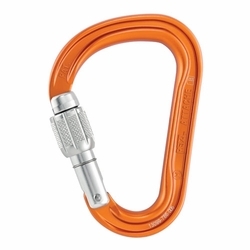 Petzl ATTACHE Carabiner. Thanks to its compact shape and SCREW-LOCK locking system, the ATTACHE is designed for multiple uses related to belaying: connecting a belay system to a harness, belaying with a Munter hitch... It has an H cross section to reduce weight, as well as the Keylock system to avoid the carabiner snagging during maneuvers.